The days since Salta Argentina have been busy with riding and motorcycle repairs, so I will do a brief recap to get us all caught up and then Alex will be posting a blog soon about new adventures. After our day of motorcycle maintenance in Tupiza, which also included paying our Argentinian reciprocity fee ($160) and printing out the receipt, we were off to the border to cross into Argentina. What we didn’t know was that this was going to be the longest border crossing of the trip. While many of the borders in Central America were long due to copious amounts of paperwork or bureaucracy, this border crossing was long simply due to the amount of people and the lack of employees. We got to the border at 11am, and wouldn’t be done till close to 4:30. The main hold up was getting stamped out of Bolivia and into Argentina. Both lines were over two hours of waiting, in the sun for the majority of the time. The climax of the day was Alex and I yelling at people that were trying to cut in line and getting one of them sent to the very back. We both don’t mind waiting if everyone is waiting the same amount of time, but there is a special place in hell for people who think that line cutting is ok. Yeah I’m talking to you guy with the faux-hawk and nerd glasses! Knowing halfway through the process that we were not going to making our goal of Salta by nightfall we decided that we would just drive as far as we could, hoping that we might make it to Jujuy. At dusk (considering we never know what time it is in a new country), I pulled over to the side of the road to point out the giant sundial on the side of the road, that marked the tropic of Capricorn (the southern most latitude where the sun is directly overhead at noon). Having just passed a fancy looking hotel and being out in the middle of nowhere, we decided to see how much the hotel cost and make a judgement of weather or not to keep going. The hotel ended up being the most expensive of the trip, but Alex and I were beat and it was legitimately a distinct building having been constructed in the early 1900’s. The next day it was up and off to Salta where I needed to get my fork seals replaced. We got into town and found the shop we were going to take the bike to, and it was closed. A man passing by informed us that it was siesta time and that the shop would reopen at 4:30. We went and got sometime to eat as we waited, and later found out that the entire city shut down between two and four-thirty and that restaurants wouldn’t even start serving food until eight at night. Got the bike delivered and were told they wouldn’t be able to get to it until Monday as Saturday they were busy and they weren’t open Sunday. The meant we were stuck in Salta for three extra days we weren’t planning on. Not the biggest deal, but Salta isn’t the best city to be stuck in and they were uneventful days. 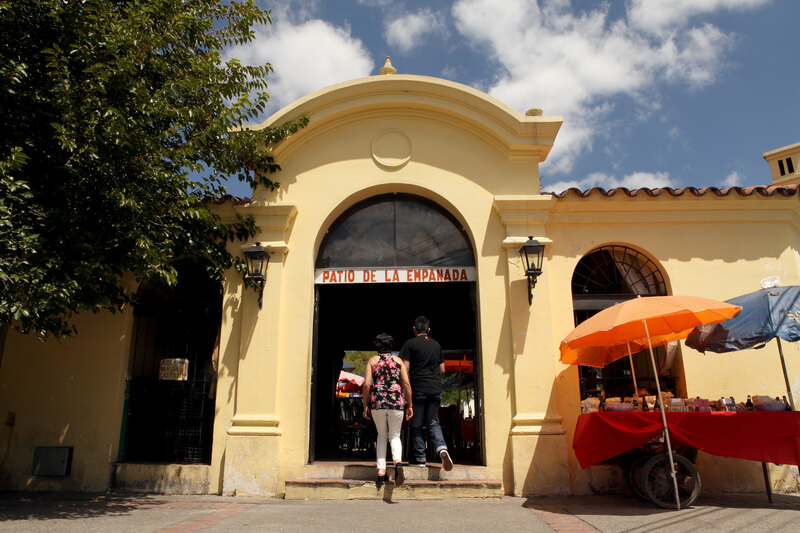 One of its claims to the fame is that they say they invented the empanada and so Alex found a market that only served the doughy pastry. 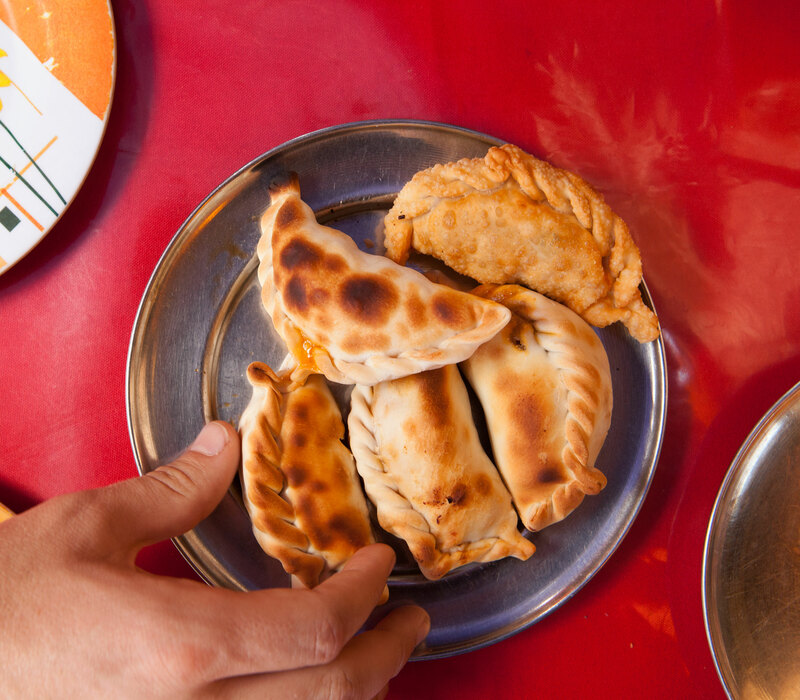 We went and enjoyed many different verities of empanada, but the best one we had in my opinion was at a restaurant on the main square of town. Monday came and we picked up the bike in the afternoon and prepared to leave the next day. That night was the most intense lightening and thunder storm we both have ever experienced, with one waking me up that sounded like a car explosion. The torrents of rain that accompanied the thunder was enough to saturate the ground and caused our bikes to fall over in the patio of the hostel. We packed and prepared for a long day in the rain, but were lucky that it must have rained itself out as we slowly made our way out of Salta and on to the open road. Mmmmmm- Empanadas!!! Said in my best Homer Simpson voice!! !